So many good things are on the go right now (not forgetting you, your growth, and some cool new words such as moon, stars, mine, hot, peeeeeeease, and your new favourite – the head shake). – Our shelves are almost up. My study is totally shelved, along with your playroom, and the TV room is almost done. We had a panicked hour or so yesterday when I couldn’t fit one of the cables into the decoder because it was too short and I could sense that Shaun the Sheep and Lola needed to make a reappearance. Fortunately it was all sorted. (addendum: I need to mention here that through Twitter, I found the most awesome shelf guy. Thank you @dan_vh I was almost in the poo a few weeks ago when the original shelf guy who we had used a few years ago, was not delivering on work or a refund. But thanks to Twitter and a good recommendation, my books will have a good home. – Our garden is likely being done next week. Can’t wait – we’re going to have a herb garden, and we’ll find a great spot for your new sandpit. – I’m going to see Coldplay on Saturday night. They are one of my fave bands. Say no more. Sorry dude, you’re too young to go. I promise to take you to a concert when you’re older. – I’m having a one on one makeup lesson next week. Many awesome people have tried to teach me in the past, but I’ve never really tried to do it hands-on and without looking like a four-year-old who has smeared too much MAC on her eyes. It’s them, not me. But this time, I’m determined. – South Africa vs Australia cricket coming up soon. Going to a 20/20 match at the Wanderers. Think I might faint with excitement. As with Coldplay, you’re a little too young to appreciate the game, but if you’re a cricket lover *holds thumbs*, I promise to take you one day. – The announcement of the Boeke Awards winner is tomorrow. Oh please, let The Slap or When G-d Was a Rabbit win. I was one of the judges, and those were my faves. – I am planning on wearing my new Cons a lot. In case you don’t know this about me, I love Converse shoes, and have just a few pairs *cough*. 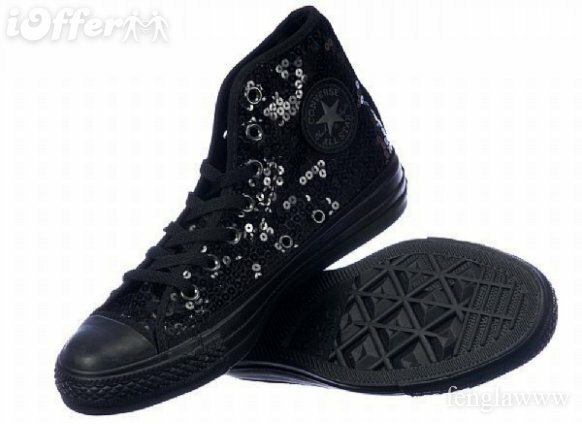 The latest are black hi-top sequins. I cannot wait for when we can wear matching Cons (I swear I won’t choose pink). – Woolworths has just brought out choc chip vanilla yoghurt. Oh em gee. I ate an entire huge tub today for breakfast and lunch. I’m telling myself it’s full of calcium for women my age. It is the best thing Woolies has launched, since, well, everything in fact. I have also found Hello Kitty tins of chocolates, which will make great business-card holders. Looking forward to more good times. Thanks for being awesome and becoming more so by the day. Errr, I’m assuming the Hello Kitty tins WERE full of chocolate that they now can become business card holders?? lol I’d give my right arm for a tin of chocolate now. I’m glad I could be of assistance. Let them shelves hold many things, including happy memories of Max and his growing years.